Cescaphe's Down Town Club is a marvelous wedding venue located in the heart of the Old City Philadelphia. It amazes me how different and unique this place can look like every time we document a wedding there! Even a little tweek like changing the uplighting color, can set an absolutely different mood and paint the room in different colors. 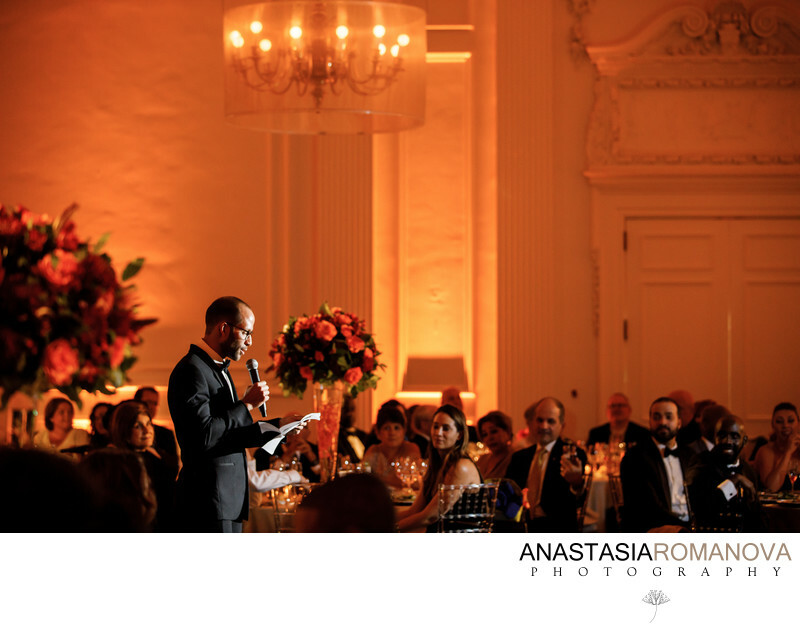 On this photograph we captured the best man while he was giving his speech for the bride and groom at one of the fall weddings here at Down Town Club. After doing a few 'safe' traditional photos, I decided to walk around the room and see what other interesting angles might be available. I noticed how nicely the best man could be framed in between the centerpieces and the gorgeous chandelier in the back. I especially loved how the guests were seen in the frame too as they were listening to the best man's speech. In order to lit reception moments like this one, we usually use off camera flash on the monopod so that we can have complete control over the direction of the light. Here the off camera flash is located to the camera's right. As experienced wedding photographers, we take responsibility for capturing not only candid moments through the day, but we also want to make sure those moments look artistic, unique and perfectly composed.